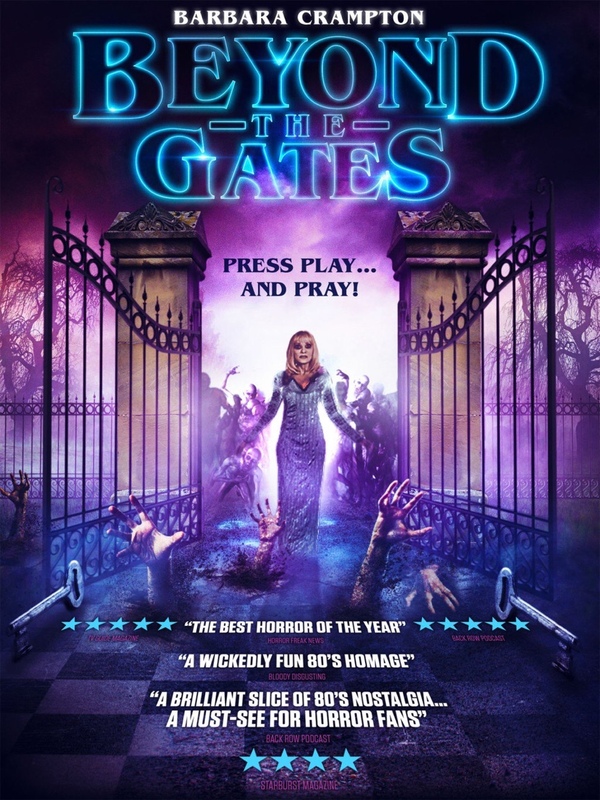 John’s Horror Corner: Beyond the Gates (2016), an evil VCR board game movie with a distinct 80s feel. MY CALL: Outside of a few shocking and impressive gory scenes, this film was largely just very poorly written and tedious despite boasting a solid cast. MORE MOVIES LIKE Beyond the Gates: Other “reality-altering board game” films include Open Graves (2009), The Black Waters of Echo’s Pond (2009), and of course the non-horror adventure classic Jumanji (1995). Is it just me, or does Graham Skipper (right) look like a hybrid of Rainn Wilson and Elijah Wood? Months after the mysterious disappearance of their father, Gordon (Graham Skipper; Tales of Halloween) and John (Chase Williamson; The Guest, Siren, John Dies at the End) return to their home town to pack up dad’s old video store. The estranged brothers clearly never got along well in adulthood; their relationship is understandably awkward and a tad contentious. But they find comfort in their shared memories of the store, nostalgically wall-to-walled with videotapes. I loved seeing the deep, tall rows of movie racks. How I miss those days. Still inside the VCR of the video store office, the brothers find a VCR board game tape called Beyond the Gates. The game has a hostess, Evelyn (Barbara Crampton; You’re Next, Lords of Salem, Chopping Mall, We Are Still Here). This hostess seems surprisingly more “interactive” than one might expect as she speaks directly to the players and mentions their father’s soul…from the TV! The game affects people who aren’t even playing like Gordon’s girlfriend Margot (Brea Grant; Smothered, Halloween II, Dexter, Heroes), a childhood friend-turned police officer (Matt Mercer; Contracted, The Mind’s Eye, Madison County), and John’s jerky friend Hank (Justin Welborn; Siren, Southbound, V/H/S Viral). Despite this cast of horror-experienced actors, once the “horror” begins the poor writing hamstrings their performance. The game is a complete mystery. Not in that it is “mysterious” in nature, but in that I had no idea how to play the game. Evelyn says “to get the key, roll the dice,” they roll the dice, they get a key…and something awful happens. LOL. This repeats itself a few times. Even though the key scenes don’t make any sense, along the way we do get a satisfying voodoo doll scene bringing someone to a splattering disembowelment (a pretty solid scene, a blast actually). It was a delicious mess. But overall the game is aimlessly random, gathering keys to open a magical gate to another world (Hell?) that has appeared in their basement. We understood how Jumanji (1995) worked—you rolled the dice, occasionally landed on a location or read a card, and then you lived the result. Simple. Yeah, these filmmakers must not have seen that Robin Williams classic. LOL. Our only comfort is an exploding head here, some gooey head-smashing gore there, and all the while never understanding why. Director Jackson Stewart’s first feature length film overall, I fear, long missed the mark. The movie fan nostalgia of the video store was a nice touch, even if handled better by a more experienced filmmaker. The real victories of this film were the gory scenes—which were quite impressive even if their surrounding scenes and staging were poor—and the score. During the opening credits I was swept away to the 80s as if I just popped a VHS tape in the VCR to watch this very film. The ending wasn’t satisfying. It harkened back to 80s horror in a mildly pleasing manner for the closing twist, but the resolution of the game itself (i.e., the violent finale and the reasoning behind characters’ actions) was just wretchedly incomprehensible. It’s hard to recommend this. However, there was just enough that I’d be interested to see what he does next and, perhaps most critically, with a very different writing team. I’m not really sure how much freedom Stewart really had. ← John’s Horror Corner: The Shallows (2016), Blake Lively’s bikini meets Jaws (1975) and Castaway (2000) in this fun shark attack thriller.